I was one of the subscribers to the Ubuntu Edge crowd-funding campaign and advertised it here in this space. I believe Convergence is the future of personal computing, the secular electronic miniaturization trend will eventually lead to a single personal computer unit, instead of the myriad devices that litter our workspaces and pockets today. Convergence entails an unprecedented reduction in resources and energy required to manufacture and use a personal computer. But that was all a long while ago, two years on and the hardware landscape remains pretty much the same. Both Canonical and Microsoft are public in their efforts towards Convergence, but it is yet to materialise. A couple of months ago Guido Stepken posted the specifications of a laptop computer powered by an ARM mobile processor, the Nvidia Tegra K1. 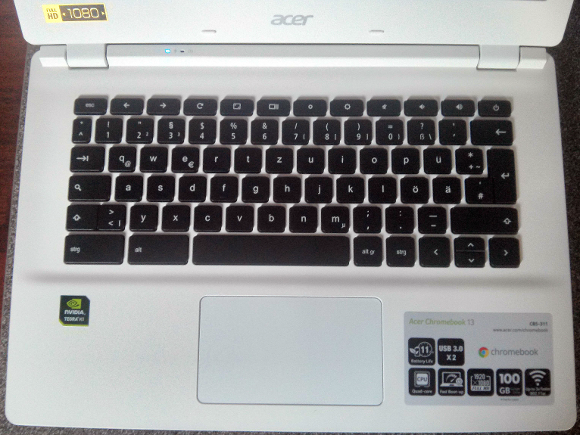 On a first look, the Acer Chromebook 13 provides the same or better than my much battered x86 laptop: a four cores processor, 4 Gb of RAM, a 1080p resolution screen, USB 3.0 ports. Only the 32 Gb of SDD storage leave something to be desired for. But the most impressive of all is the price: 285 € (VAT included). After some more reading I decided to acquire the damn thing. 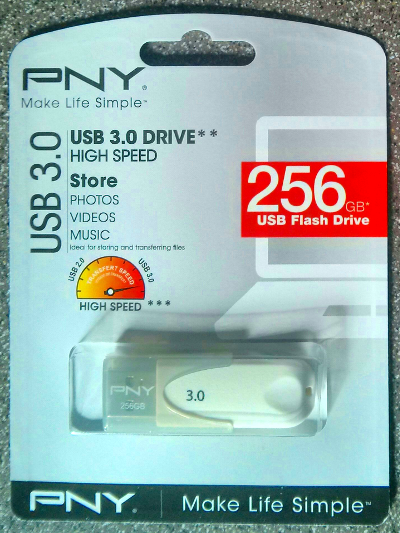 The goal is to understand how far such architecture can reach in replacing my current laptop. 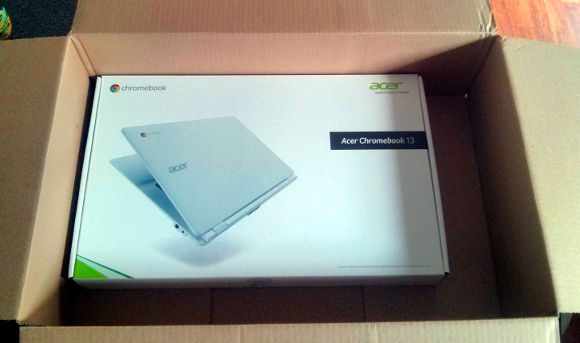 Amazon posted the Chromebook inside a huge box. When I first saw it at the post office I thought there was some mistake. Coincidently, on that particular day I was on foot, it would have not been possible to bring the package home on the bike (my usual means of locomotion). Inside the mail box would have comfortably fit two Chromebooks plus two or tree packages of crisps. I thought mailing was a bit more efficient these days. 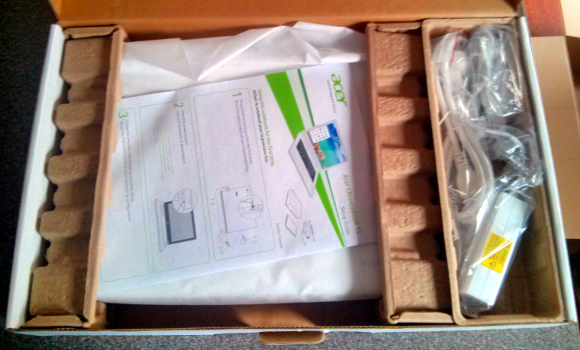 Even inside the real Chromebook box there is a good deal of empty space, although here safety concerns are evident. I appreciate the overall presentation and displacement of components. After unwrapping the Chromebook one gets a crisp white chassis, that even before opening the lid strikes for its weight. 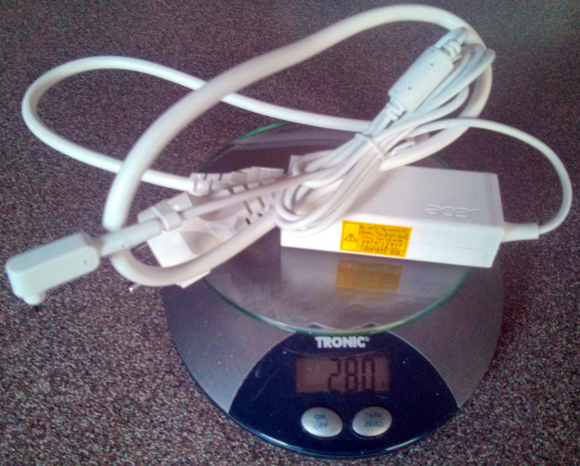 It is just over 1 400 grams, pretty remarkable for the kind of hardware it contains. And it is not only the chassis itself, the power cord and transformer are too rather minimalistic and light. The white colouring also helps with the crisp image the overall equipment presents. Light and also thin. 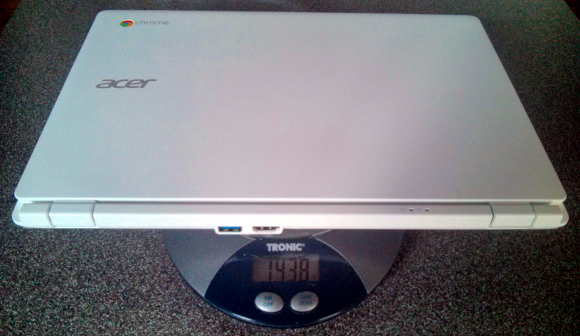 The picture below puts the chassis in perspective with the power plug. Measuring with a plastic ruler, the chassis seems to be under 20 milimeters thick. But not all is great, opening the lid comes a minimalistic keyboard, too minimalistic for comfort. It is missing loads of keys, such as PgpUp, PgpDwn, Home, the F keys and more. Most worrying of all is the absence of the Super key. Later on I would learn it is not as serious as it looks, but it still spells trouble. Apart from the Chromebook I also order this little thing depicted below. The goal is to have the system drive and home folder both harboured there. So far what I can say is that it is really fast. And now the journey begins. The first step is to get Ubuntu - my desktop operating system of choice - running on this hardware. I will start by trying to boot Ubuntu from the USB stick; if successful, I might then try to install Ubuntu directly on the SDD drive. How will Unity perform on this hardware? Will it be fluid be enough? And can it be controlled without the Super key? With the OS running I will then try one by one the staple software I rely upon: Eclipse, Git, ownCloud, LaTeX, Firefox, QGis, GRASS, R, PostGIS. Afterwards some denser activities, like video editing, running virtual machines, calling friends through Skype. I am really curious to see how far it can go. Keep an eye on this space or on my Google+ stream for the following chapters.